The European Society for Cognitive and Affective Neuroscience aims to promote scientific enquiry within the field of human cognitive, affective and social neuroscience, particularly with respect to collaboration and exchange of information between researchers in different European countries through scientific meetings, workshops, summer schools, and such other activities. 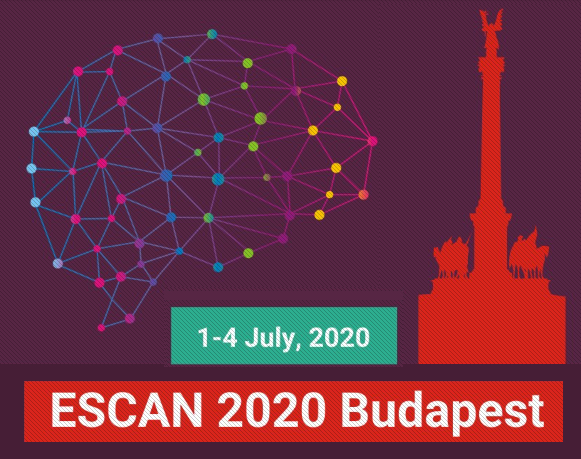 The 5th International Conference of the ESCAN will take place in Budapest. See the conference website: http://www.escan2020.eu. As ESCAN member, you can always check and correct the personal data we have about you. The General Data Protection Regulation (GDPR) legislation of the EU regulates the storage, use and sharing of individual's personal data. As a result of your ESCAN membership, your contact information is currently stored in our members’ database. These data are used for the purposes of management of the society, publication of ESCAN events, and contacts via the ESCAN mailing list. The data are never provided to third parties under any circumstances. The results of the ESCAN election are out, and we are happy to announce the election of the four candidates Agnieszka Wykowska, Giorgia Silani, Matthias J. Wieser, and Suzanne Oosterwijk. Congratulations! Participation in the ballot by members eligible to vote was 30.4%. There are up to four available positions in the board. Read the candidates' application statements and biosketches. The dates for the election are between the 7th and 18th of January 2019. An official notification from BallotBin has been sent via e-mail to voting members (as per Article 13, point 2 of the Constitution: "Every full member, retired member or honorary member who is not suspended has one vote. All other categories will be considered special members who have not the right to vote."). Check your e-mail to vote! For any queries please contact the ESCAN Board Secretary, Fernando Ferreira-Santos (frsantos fpce.up.pt). The ESCAN board is preparing an election to select new board members, that is scheduled to take place later in 2018 via electronic ballot (more information on the election will be provided at a later date). As such, we are announcing a call for nominations among the ESCAN membership for the upcoming election. ESCAN members in good standing that are committed to the duties and mission of the society are eligible to become candidates either by self-nomination or by suggestion. Members will be contacted via the e-mail address with which they are registered in the society with further instructions to submit a nomination/suggestion.